First, what is WiFi Hotspot exactly? Wi-Fi is the name of a popular wireless networking technology that uses radio waves to provide wireless high-speed Internet and network connections. A WiFi connection is established using a wireless adapter to create hotspots – areas in the vicinity of a wireless router that are connected to the network and allow users to access internet services. Once configured, WiFi provides wireless connectivity to your devices by emitting frequencies between 2.4GHz – 5GHz, based on the amount of data on the network. What we focus on in this post is the Best Free WiFi Creator Software for Windows, how to use it as well as some other WiFi knowledge. Why WiFi connection is so popular today? More and more devices are being released that include Wi-Fi functionality as well as cellular connectivity. In general, Wi-Fi lets users connect to free hotspots instead of paying their operator for data service, while it also offers faster data speeds than cellular networks. Wi-Fi is supported by many applications and devices including video game consoles, home networks, PDAs, mobile phones, major operating systems and other types of consumer electronics. 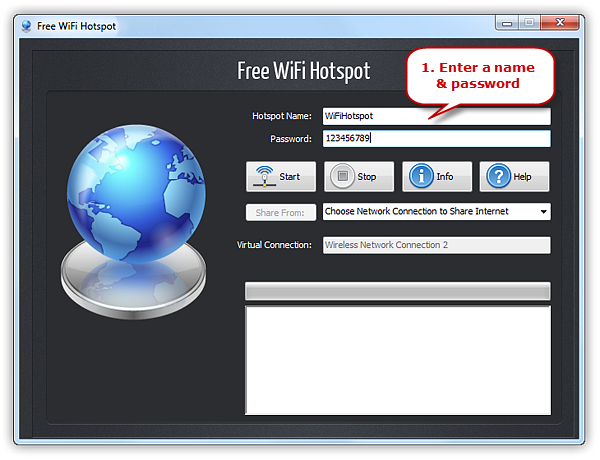 In this post, we will show you how to create WiFi hotspot on your laptop with this free WiFi hotspot creator software – Free WiFi Hotspot. From now on, just share your internet connection with your friends and their portable devices with no cost and faster speed. Let’s Create Your Own WiFi Hotspot in No Time! 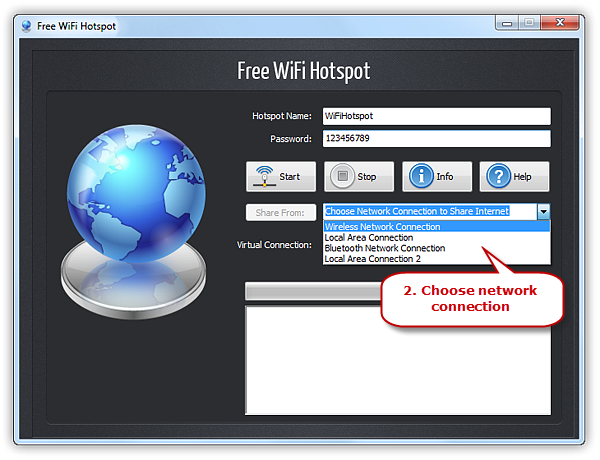 Free WiFi Hotspot is the Best Free WiFi Creator Software for Windows that turns your laptop into a WiFi access point with password protection and usage tracking. Thus anyone with any devices nearby can surf the Internet through your sharing. With this WiFi hotspot creator, just join the WiFi, start a hotspot and get all of your devices including your smartphone, tablet, media player, e-reader and other laptops online for free! 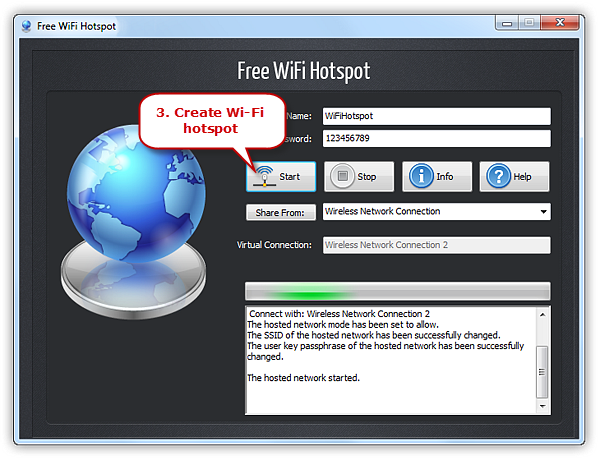 Free WiFi Hotspot is the best free WiFi hotspot creator software for Windows that can create hotspot to easily connect all devices to WiFi. Thus you don’t need to pay for any costly connections or install other hardware devices. Click “Start” button to create the Wi-Fi hotspot and within seconds the hotspot you create with the name you set can be detected by your device. You you’ve created a WiFi hotspot with the Best Free WiFi Creator Software for Windows. Although WiFi hotspot is great and convenient, you will leave yourself wide open to malicious attacks or neighbors’ leeching off the internet without a password. To protect your hotspot from getting stolen by other devices and users, preventing you from countless headaches down the road, use Free WiFi Hotspot and follow this guide to lock down your WiFi with a strong password in seconds. SSID is the name used to connect to your wireless network. 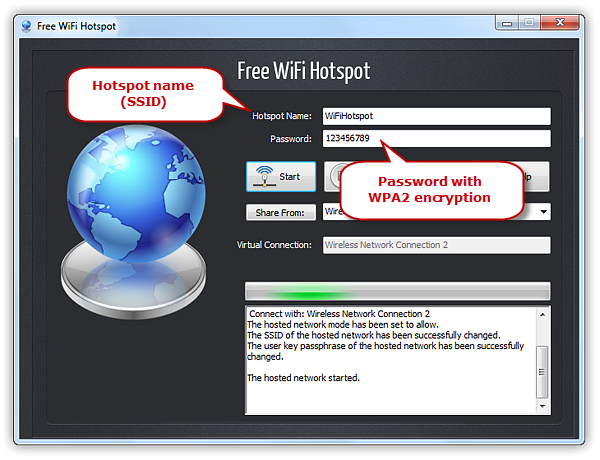 You can enter a name under “Hotspot Name” or simply use the default one – “WiFiHotspot”. Before enabling the hotspot you create, you should provide a minimum 8-digit password for it. The password is paramount with built-in WPA2 encryption in order to prevent unauthorized network access.